We take pumpkin carving seriously around here! We love getting together and celebrating holidays! This year, we'll be celebrating our 14th annual "I Survived Spring" golf tournament. The only difference between us today and in 5 years is the books we read and the people we meet. What else do you do with an unexpected snow storm at the end of March? We always have a Thanksgiving dinner together to reflect on all we're thankful for. We give the treatment you and your lawn deserve. We make good on our promises, rain or shine. We don’t get stuck in the mud, we tackle challenges. Our training never ends. The more we know, the more we can grow. I started Heritage Lawns & Irrigation in January of 1995 in the front of my parents’ house in Overland Park. I knew I could do better than the companies I had spent the previous 12 years working for. Some small companies were great at horticulture but bad at business, some large companies were great at business but bad at customer service. I knew that if I combined the skills I had learned at these companies and focused on the client, we could build an organization that would help more people than I could ever do on my own. Now, more than 18 years later, our team of professionals helps thousands of homeowners by following a clear mission and by providing the best lawn care in Kansas City, Lenexa, Overland Park, Leawood, and Olathe, KS. 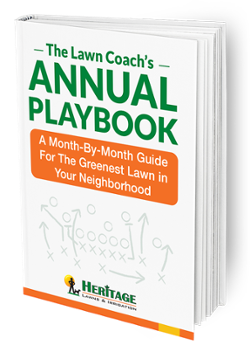 Our mission is to make all homeowners proud of their lawns. To develop an empowering, supportive, growth-oriented culture where success is the standard. To build a better future for our team, our clients, and everyone we meet. See our online mentions, business profiles, and online citations. Do You Like Who We Are?